Parsley is the perfect herb to use in early spring. It's bright green color and fresh taste echo what is happening in nature around us. And, if you have it in your garden, you've probably already discovered it beginning to grow again. 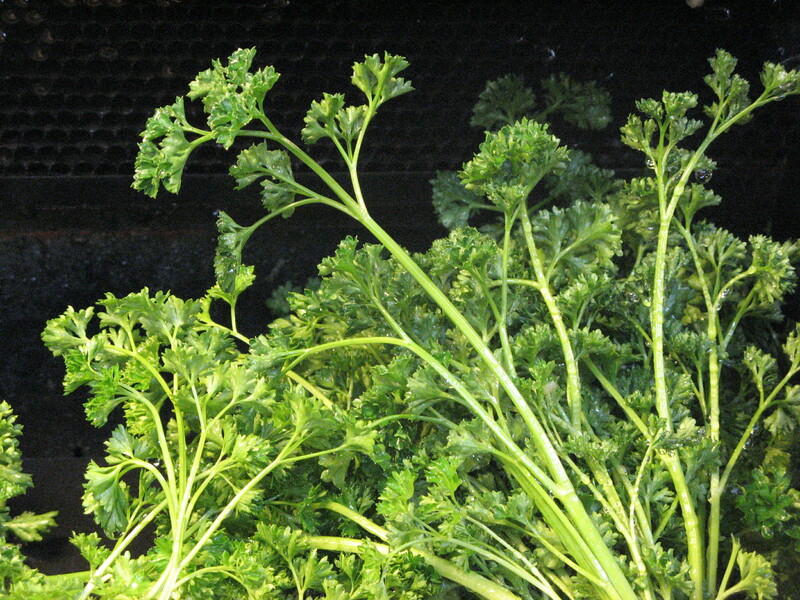 There are two varieties of parsley in common use: curly parsley and flat-leaf or Italian parsley. 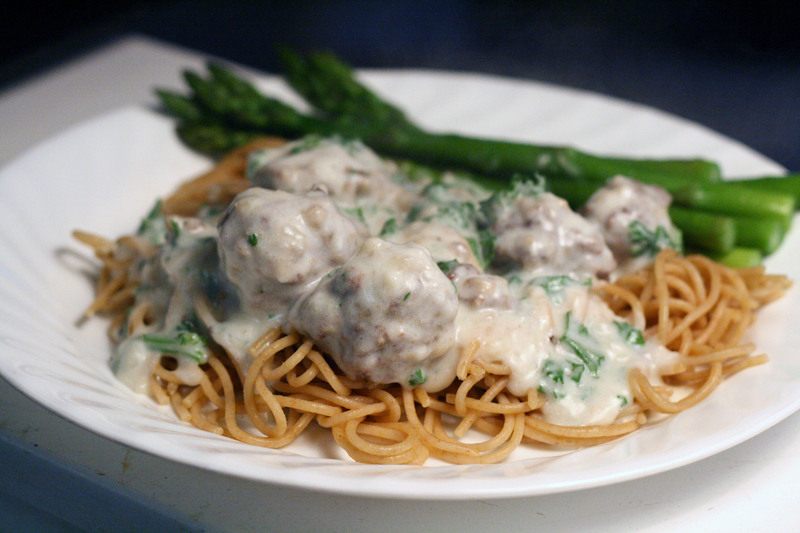 Many people prefer the Italian parsley and claim it has a more intense flavor. I prefer the curly parsley and feel it has a much stronger flavor than flat-leaf. Perhaps its nostalgia that attaches me to it -- my Grandmother always had a large patch of curly parsley in her garden from which we were free to eat. It's that taste that I associate with proper parsley taste. In a large bowl, mash the anchovy fillets with the back of a fork. Whisk in the lemon juice and olive oil along with the pinch of sugar. Season with salt and pepper. Add the lettuce and parsley. Toss to combine. 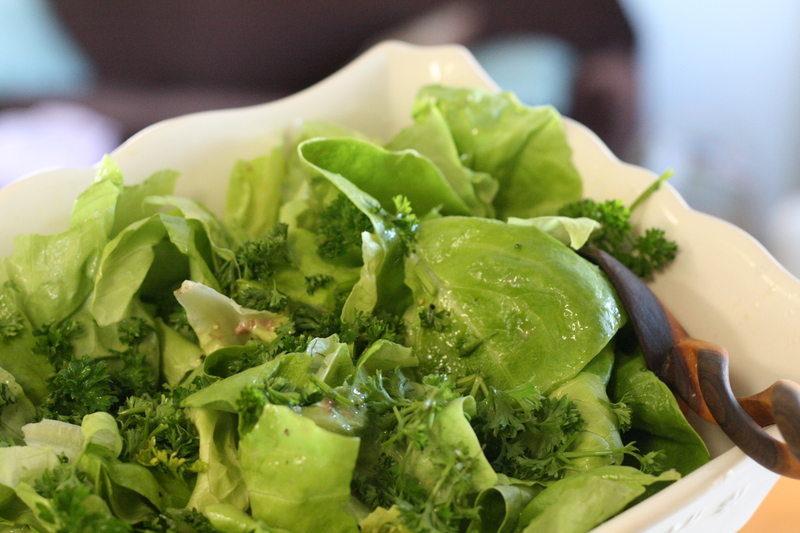 Parsley sauce is a delightful way to enjoy parsley in the spring. It makes a wonderful sauce to accompany chicken, fish or pasta. Pour the milk into a medium pan and add the onion and bay leaf. Bring to a gentle simmer and cook for 5 minutes. Turn off the heat, then leave to stand for 30 minutes. When cool, remove the onion and bay leaf. Melt the butter in a small pan and stir in the flour. Cook for 30 seconds. Slowly add the milk to the pan, stirring. Simmer gently for 5 minutes, stirring continuously. Stir in the chopped parsley. Season with salt and pepper (and nutmeg if you like). Keep warm over a low heat, stirring occasionally. I will try that salad dressing recipe soon. Hubby brought home a can of anchovies that was given to him. I actually like them, even on pizza (which you don't find anymore like you once did). This is really coincidental (or maybe not!) because yesterday I bought a big bunch of fresh parsley and I also finally found a source of (pretty cheap) anchovy fillets. We just ate panfried anchovy pizza (with black olives, mozzarella, mushrooms, tomatoes AND oregano :-D) garnished with parsley last night. Considering the fact that I'm not exactly partial to anchovies that parsley sauce will probably find itself bubbling away on my stove sooner than the salad dressing but my mom is CRAZY about anchovies so maybe not.. :-) Thanks for posting, Heather! Keep up the AWESOME work!! Um, is it just me or (I was just re-reading the recipe!) have you forgotten to add the chopped parsley to the parsley (!) sauce in that recipe? !